I'm off to Japan now. The last days were super busy because I had to meet EVERYONE once again. It's so sweet how caring all my friends and family are! It's hard to leave but I'm full of joy and happiness and can't wait to be there! 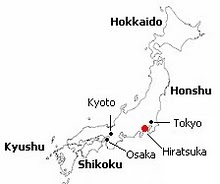 I'll post when I got there but it may take a lot of time because I live sort of far away from Tokyo in Hiratsuka and it may take a few hours to get there from the airport because it's on the opposite side of Tokyo! I also made a blog about Japan only, but it's in German because this is dedicated to my friends and family. Maybe it's interesting though, I'll update more often there & on more personal related things.